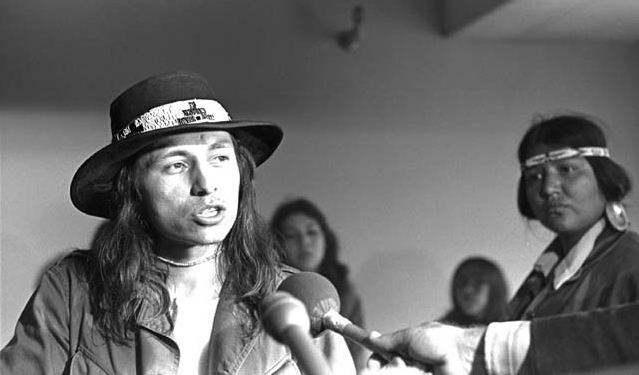 John Trudell is an acclaimed poet, national recording artist, actor and activist whose international following reflects the universal language of his words, work and message. In addition to his music career, Trudell has played roles in a number of feature films, including a lead role in the Mirimax movie Thunderheart and a major part in Sherman Alexie's Smoke Signals. He most recently played Coyote in Hallmark's made for television movie, Dreamkeeper. 1- Every human being is a raindrop. And when enough of the raindrops become clear and coherent they then become the power of the storm. 2- Everything that has ever happened to us is there to make us stronger. 3- The strength of the poetry as we enter into whatever it is we are entering into, will be determined by the clarity of the thinking we put into it. 4- In the society of illusion, reality must manifest itself. 5- Protect your spirit, because you are in the place where spirits get eaten. 6-The past is more than a memory. 7-Sometimes when it rains, it's not that simple, when the sky has reasons to cry. 8-It’s like there is this predator energy on this planet, and this predator energy feeds on the essence of the spirit. 9-I'm just a human being trying to make it in a world that is very rapidly losing it's understanding of being human. 10-We must go beyond the arrogance of human rights. We must go beyond the ignorance of civil rights. We must step into the reality of natural rights because all of the natural world has a right to existence and we are only a small part of it. There can be no trade-off. 11-We’re not Indians and we’re not Native Americans. We’re older than both concepts. We’re the people, we’re the human beings. 12- The great lie is that it is civilization. It's not civilized. It has been literally the most blood thirsty brutalizing system ever imposed upon this planet. That is not civilization. That's the great lie, is that it represents civilization. 13-Our bones, flesh and blood are made up of the metals, liquids and minerals of the earth and everything on this planet is made up of the same things. As humans we have being, so everything on the earth does too in our culture, because we are made of the same thing. 14- "We are a spirit, we are a natural part of the earth, and all of our ancestors, all of our relations who have gone to the spirit world, they are here with us. That's power. They will help us. They will help us to see if we are willing to look. We are not separated from them because there's no place to go -- we stay here. This is our place: the earth. This is our mother: we will not go away from our mother. 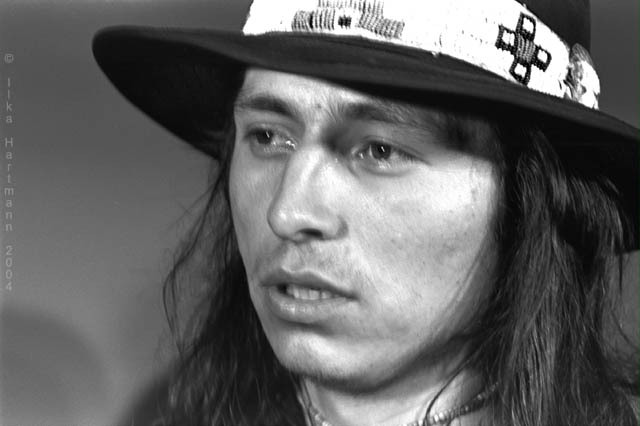 Responses to "14 Quotes From John Trudell That Will Make You Question Everything About Our Society "
Respect! I relate deeply! Thank you so much for sharing! It is so interesting how everything John Trudell expresses about our spirit and our relationship as human beings to the universe, I have learned and I am still learning through dance. Our mind, body and soul are connected indeed! one of my favorites: "My DNA needs THC." from an interview in High Times magazine several years back. These 14 quotes did not make me question society, but let me know that I am not alone in my thoughts about society ! Great words but sure wish they'd capitalize the E when talking about Earth. Even when talking about Earth as in soil, being that it is a part of Earth it still should be capitalized. Thank you. Brilliant concept of the existence of the Spirit! All great quotes but missing one thing"God"! Trudell has been many things in the past, all of which has to lead to who he is today. And that is a wise and truthful teacher for the rest of us. So which god does anonymous want us to add to their collection? Why mar thoughts of another, (obviously a more thoughtful person would not do so) because of some concept that is so gravely misunderstood and wildly mixed up? 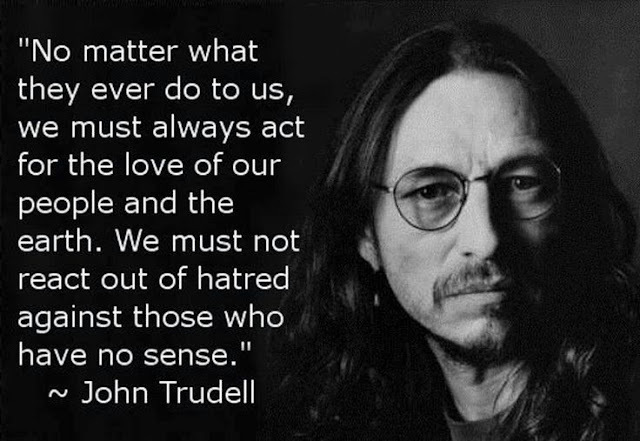 Please leave your shallow concepts in some forum more suited to such comments and respect John Trudell for who he is and try to glean some wisdom from him as he deserves. Try to humbly learn instead of deceitful sanctimoniusness. There is a great deal of difference between indoctrination and education. Good on you John, thank you for thinking and sharing. perfect. did not expect this comment. thc tis an elixir. Hey! the guy who said that john needs to have a quote about your "god" here's one for ya! Now go to a christian website and take your bible thumping there with you. John Trudell and his words will be sorely missed in this world. May he rest in peace. Today the sky is crying John Trudell walks on to the arms of the great spirit. I cry too. Agree on All points except #14.. Context. Everyone has it. There is ONE True God. People call this God different things as their Context informs them. This one True God is the Source of the Everything and the Nothing. (Do you understand? That is the Top Level. The System of Systems.) This one true God is ALL that there is. EVERYTHING, Anything, Something, Nothing. Even the Christians, who believe it or not are doing the best they can with the tools that they have been given. (I agree that Many have missed the point of Being Christ-like----isn't that what JC meant, when he said "no way to the Father..." ?? But still they are us, and we them. I AM WE ARE.) Even the Muslims. Even the New Agers. Even The MorningStar. Even Hitler. Before you HATE, try and consider if there isn't something in your own Context which is bringing about some hint of fear in you. Because HATE is an illusion. It is not the opposite of Love. Love has no Opposites, like the Source, the One True God. We're ALL SLAVES to our context-Even Me. So I consolidate. I have never heard of Trudell until he passed on-But I know we could have consolidated our Context. A decent man, human and natural. More a brother because of his spirit and good heart than if we had lived as blood brothers. I will echo your thoughts in my life and time. R.I.P. 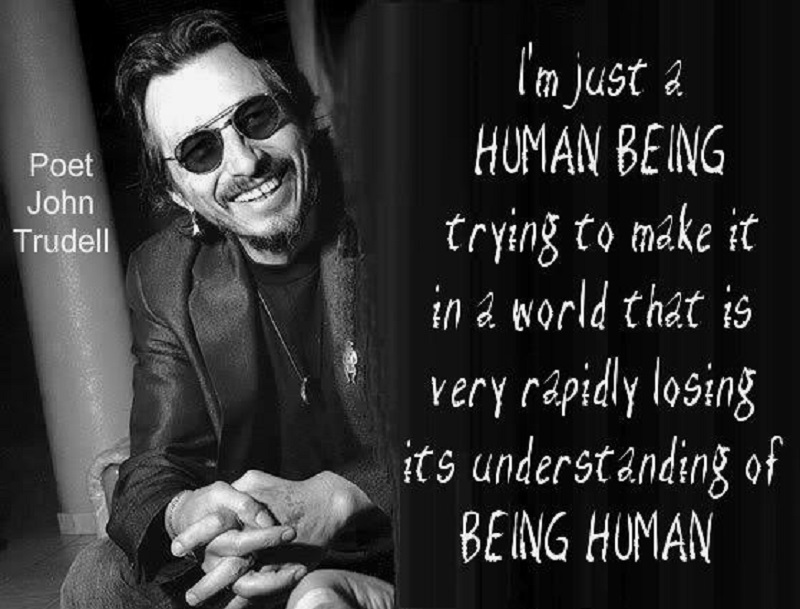 John Trudell. I loved John Trudell from the very first encounter and, I, as so many others whose lives he touched, will always love John Trudell.... even in to the spirit world.Johns earth-walk was a gift to us all. Everything he said resonated with me. I'm so glad I found him. Incredible human being.